Shady Aboul-Enein (MSc 2009) has received a $2,000 award from the Montreal CFA* Society in recognition of the quality and originality of his master’s thesis. The thesis, entitled Collateralized Fund Obligation (CFO): Analyse de la performance de la tranche d'équité d'une transaction de titrisation de fonds de fonds de couverture, was co-directed by Professors Nicolas Papageorgiou and Georges Dionne , of the Department of Finance. Shady thoroughly analyzed the performance of CFOs and, in particular, the performance of their equity tranches. Complex derivatives products were clearly in the middle of the turmoil during the recent financial crisis. Now it is essential for strict analyses to distinguish between a bad financial product and a bad use of a financial product. It increasingly appears that one of the conclusions that can be drawn from the financial crisis is that it was not the complex nature of the financial products that was at fault, but their use by different players on the financial markets. Shady’s thesis contributes to this discussion. performance and zero correlation with equity and credit markets. His research also finds that CFOs can be instruments adding value for equity holders. A copy of the thesis is available on the Website of the Canada Research Chair in Risk Management. The Montreal CFA Society is a non-profit association founded in 1950 with a number of goals, including assisting members in their efforts to pursue their educational development by organizing conferences. To earn the CFA title, candidates must pass three CFA Institute exams and have four years’ relevant work experience in finance. 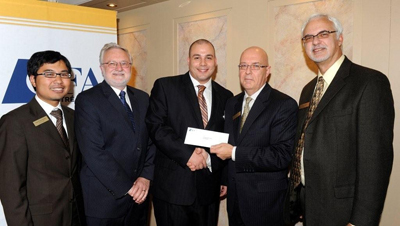 From left to right: Jean-Pierre Khlot, CFA, Caisse de dépôt et placement du Québec; Georges Dionne, co-director of the thesis; Shady Aboul-Enein, award winner; Mario Lavallée, CFA, AON Conseil and President, Montreal CFA Society; Ian Rakita, CFA, Concordia University.